I am SOOOO excited to announce that today, on Giving Tuesday, I passed my 2018 goal of $300,000! Thank you so much to everyone for your support and donations!!!!! I am so grateful! I will continue to juggle and speak and do everything I can to support St. Jude, until no child gets cancer. I hope you will be there every juggle of the way! PLEASE VOTE FOR #MyGivingStory and help me win $10,000 for St. Jude Children’s Research Hospital! You can vote every day until December 7th. Please share! The essay is taken from speeches I have done, and it tells my story of why I have chosen to spend so much of my childhood raising money for St. Jude and #ChildhoodCancer. Thank you for your support! I’m late to this contest, so I have a lot of votes to make up! Please share with family and friends and anyone who might want to help kids with cancer! YOU CAN VOTE ONCE PER EMAIL, PER DAY, THROUGH DECEMBER 7th! 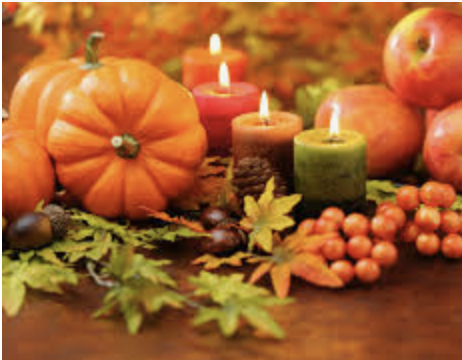 This is the THANKSGIVING NEWSLETTER I sent to my donors this morning. 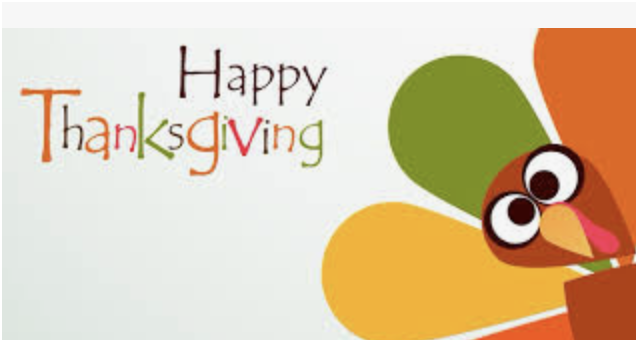 Thank you for reading, and Happy Thanksgiving! It’s almost Thanksgiving, which means Giving Tuesday is right around the corner. This time of year is all about being grateful for what we have and giving back to others in need. As you probably know, there are some really bad fires happening in California. Where I live, the air has been horrible from the smoke, and school was actually cancelled for today. My family and I will be helping families affected by the fires, and I’m sure many of you will support them, as well, as they fight through this very difficult time. There are so many causes to support, and my goal is to always highlight St. Jude, because I think what they are doing is so important. With so much crazy stuff going on in our world today, one thing we can all agree on is that kids shouldn’t get cancer! $300,000 IS IN REACH! Thanks to donations from people like you, as well as a very generous corporate donation from In Shape Health Clubs, we have almost reached the $300,000 mark, which is my goal for 2018! Yesterday, my mom and I drove to pick up a $50,000 check from In Shape. There was a lot of traffic, so it took more than two hours to get there, but it was for sure worth the trip! I am so grateful for the support of In Shape, and one of my goals is to partner with other corporations in their annual giving, so let me know if you have any leads! So, now there’s just over $3,000 to go till $300,000! I hope you will help me reach that milestone with a DONATIONof any amount. Every bit adds up! Why St. Jude: For families experiencing the diagnosis of childhood cancer, every day is a fight. 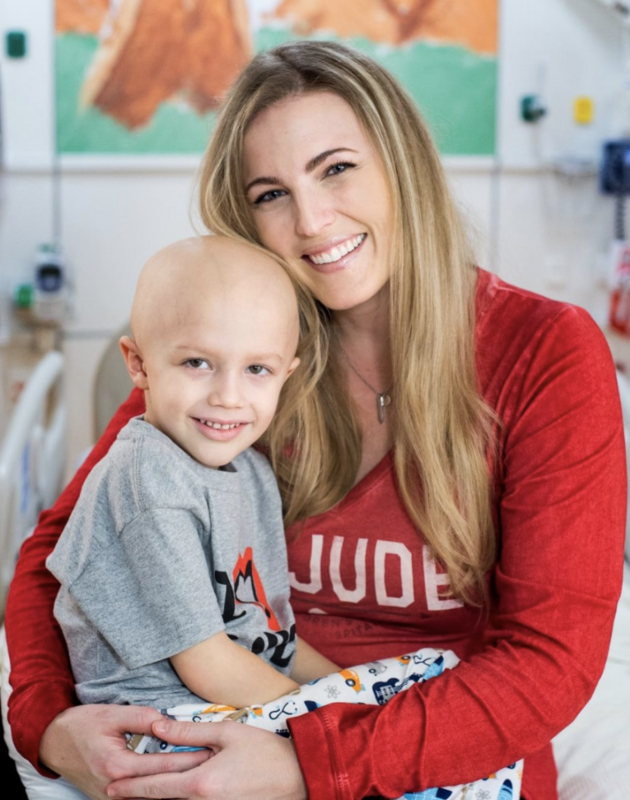 You’ve heard it before, but St. Jude is the worldwide leader in the treatment and research of childhood cancer, and St. Jude patients and their families don’t pay a single penny for their treatment, travel, housing, or food. St. Jude offers hope in the darkest times, and they are increasing childhood cancer survival rates every day. Last September, Woods complained of headaches, ran a fever and threw up in the mornings after he woke. His parents, Ashley and Henry, worried something was wrong. Just before Woods’ fourth birthday, their fears were confirmed when a CT scan revealed Woods had a type of cancerous brain tumor called medulloblastoma. Ashley and Henry were familiar with St. Jude Children’s Research Hospital and asked for a referral. “We wanted to be where doctors saw hundreds of these types of cases,” Henry said. Within days, the family arrived at St. Jude. At St. Jude, Woods underwent surgery to remove the tumor, followed by radiation therapy and chemotherapy, which he completed in May 2018. His family celebrated the end of his treatment with a No More Chemo party, attended by family, friends and Woods’ St. Jude care team. How to Help: When you DONATE, your money goes directly to treatment for kids like Woods, and sometimes even a No More Chemo Party, because St. Jude recognizes that celebrations like that are part of the overall treatment. It’s all about hope and happiness! Give the Gift of a Soccer Ball this Holiday Season! 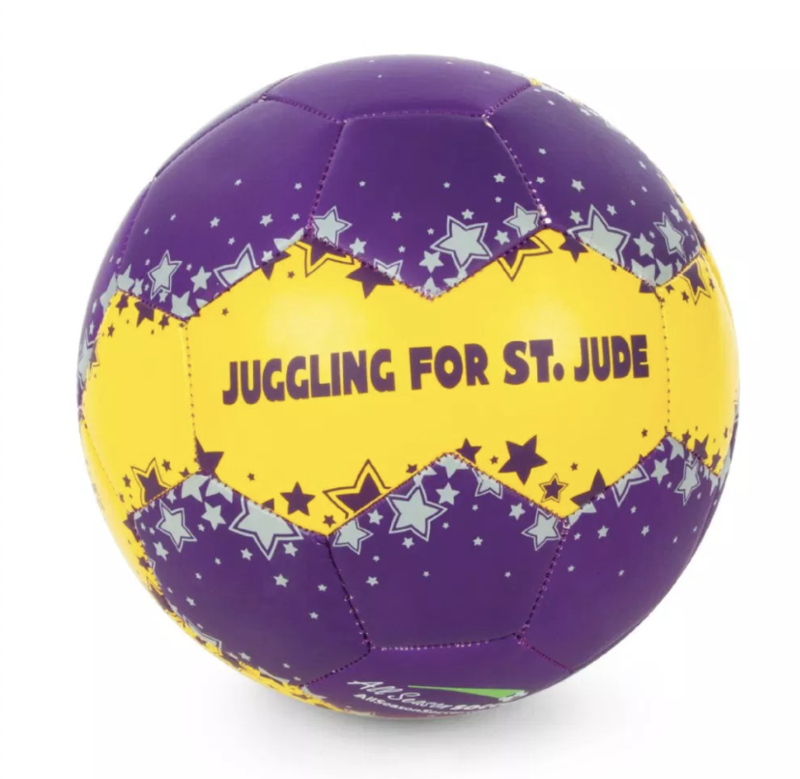 Sales of Juggling for Jude Soccer Ball support St. Jude! To order a ball to be shipped to you or to send one as a gift, click HERE. 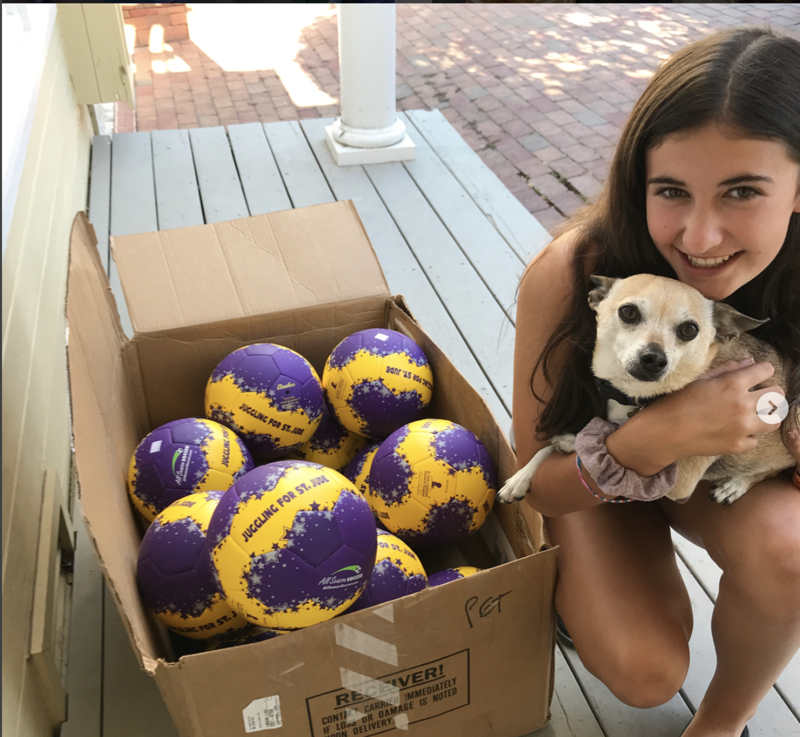 If you’re in Marin, you can also email me my mom (allison@tjsgym.com) and she can arrange to get you a ball in person. THANK YOU SO MUCH FOR YOUR SUPPORT and help getting to my next goal! Pease feel free to donateany time at THIS LINK and share this email and my story with anyone you think might want to support the lifesaving work of St. Jude. Together, we can rid the world of childhood cancer! 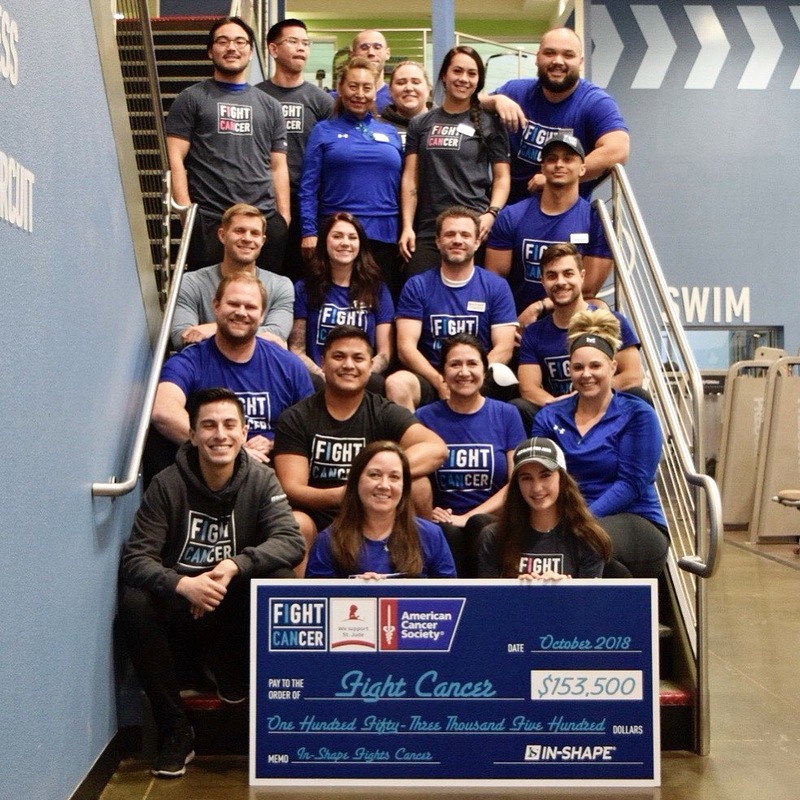 I am so grateful that In Shape Health Clubs decided to support St. Jude again this year, in their month-long FIGHT CANCER campaign in October. This year, they raised $153,000 total and donated $50,000 of that to St. Jude! I am so honored that In Shape was inspired by my work for St. Jude and chose to give so much. It’s a pretty amazing effort by their entire community! Today I got to collect the funds for St. Jude and took this photo with a number of In Shape staff members who worked so hard to raise the money. It took me and my mom two hours to get to In Shape, but it was SOOOOOO worth it! 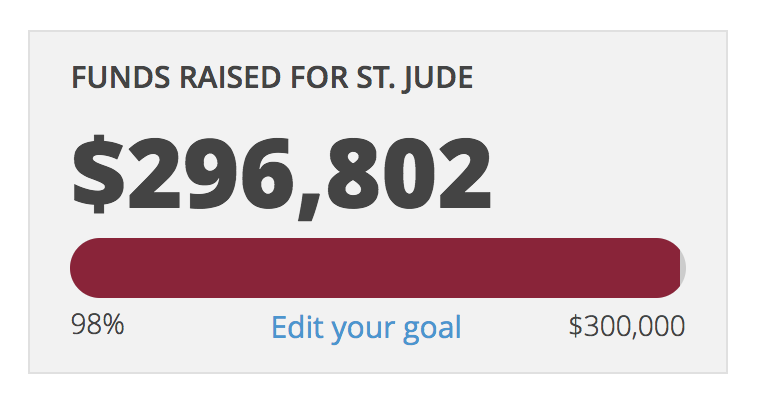 I am now about $3,000 short of reaching this year’s goal of $300,000 for St. Jude. It’s almost Giving Tuesday, so I’m hopeful that I’ll get there soon! If you’d like to help kids with cancer, please consider donating at the link HERE. It only takes a minute, and every penny goes straight to St. Jude!